Junior Calypso Preliminaries - East Arima Velodrome Saturday 16th January 10:00 a.m. Junior Calypso Preliminaries - South Palms Club, San Fernando Sunday 17th January 10:00 a.m. Launch of Panorama Skinner Park, San Fernando Sunday 24th January 2:00 p.m. Junior Calypso Preliminaries - Tobago Shaw Park, Tobago Monday 25th January 10:00 a.m.
North Single Pan Bands Preliminary Queen's Park Savannah Thursday 28th January 7:00 p.m.
South/Central Preliminary & Zonal Finals Skinner Park Friday 29th January 7:00 p.m.
East Preliminary & Zonal Finals Trincity Expo Site Saturday 30th January 2:00 p.m. Junior Calypso Semi-finals City Hall, P.O.S. Saturday 30th January 10:00 a.m.
North Preliminary & Zonal Finals Queen's Park Savannah Sunday 31 January 2:00 p.m.
Tobago Preliminary & Zonal Finals Shaw Park, Tobago Tuesday 2nd February 8:00 p.m.
Extempo Preliminaries Deluxe Cinema, P.O.S. Thursday 4th February 8:00 p.m.
Unattached (Calypso) Finals The Greens, Piccadilly St., P.O.S. Thursday 4th February 8:00 p.m.
Dance Rehearsal for Carnival King & Queen Preliminaries Queen's Park Savannah Saturday 6th February 7:00 p.m.
National Panorama Semi Finals - Conventional Bands Queen's Park Savannah Sunday 7th February 1:00 p.m. Junior Calypso Finals Queen's Park Savannah Monday 8th February 10:00 a.m.
Dance Rehearsal for Carnival King & Queen Preliminaries Queen's Park Savannah Monday 8th February 7:00 p.m.
Carnival King & Queen Preliminaries Queen's Park Savannah Tuesday 9th February 8:00 p.m. Individuals (Conventional & Traditional) Victoria Square, P.O.S. Wednesday 10th February 8:00 p.m.
Extempo and Limbo Finals Queen's Park Savannah Thursday 11th February 8:00 p.m.
South Carnival King & Queen Finals Skinner Park Thursday 11th February 8:00 p.m.
Carnival King & Queen Semi Finals : THE CHALLENGE Queen's Park Savannah Friday 12th February 8:00 p.m.
"NOSTALGIA" - Traditional Mas Victoria Square, P.O.S. Sunday 14th February 1:00 p.m.
Dimanche Gras with Calypso Finals and Carnival King & Queen Finals Queen's Park Savannah Sunday 14th February 8:00 p.m.
J'ouvert Adam Smith Square and South Quay, P.O.S. Monday 15th February 4:00 a.m. Parade of the Bands Nationwide, especially in the streets of P.O.S. and at the Queen's Park Savannah Monday 15th February 9:00 a.m. Parade of the Bands Nationwide, especially in the streets of P.O.S. and at the Queen's Park Savannah Tuesday 16th February 8:00 a.m.
Berger Las Lap Steelband Contest Harvard Roundabout, St. James Tuesday 16th February 8:00 p.m.
FYI . FYI . FYI . FYI . FYI . FYI . FYI . FYI . FYI .
" . . . Before the abolition of slavery in 1834 it is clear that carnival in Trinidad was celebrated exclusively by the white elite, particularly the white French-speaking Roman Catholic elite, and some members of the coloured, again principally French-speaking and Catholic, middle-class : blacks, free and unfree, were present, if at all, only as spectators. 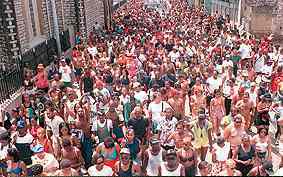 After abolition, however, carnival was swiftly taken over by the now free black population. The whites who had hitherto dominated the street processions henceforth celebrated carnival 'behind closed doors' in their own home or in private ballrooms and theatres, leaving the streets to the mass of the population, and particularly to those members of the black lower classes known in nineteenth century Trinidad as 'badjohns' or 'jamets' from the French diametre, the 'other half', in other words the criminal or semi-criminal underworld. There are, it seems to me, very definite parallels between this 'take-over' of carnival by lower-class blacks in nineteenth century Trinidad and the similar, though more gradual, 'take-over' of cricket by black West Indians since 1900. 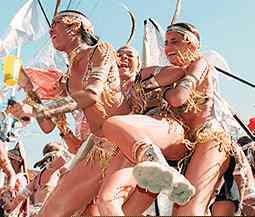 As it was taken over by blacks, so carnival in Trinidad changed unmistakably in character. Before 1834, it appears to have been much the same kind of pre-Lenten festivity that it was in Roman Catholic societies throughout Europe and Latin America; after abolition, however, it clearly become a popular black festival of liberation with such rituals as the 'canboulay' (cannes brulees) procession at midnight on the Sunday of carnival celebrating in a veiled, symbolic form the deliverance of the black population from the yoke of slavery. Not surprisingly, carnival in Trinidad, especially in the capital Port-of-Spain, was often an occasion of confrontation between, on the one hand, black revellers and masqueraders and, on the other, the forces of law and order, local policemen, and British soldiers alike. There were major clashes at carnival time in 1881 and 1883, leading to repeated attempts by the colonial government supported by the local elite to control the festivities and even to suppress them completely; a particularly target of official ire was the 'tambour-bamboo' bands from which the modern steel band is ultimately derived. By the late nineteenth century, carnival had been to a large extent 'domesticated' and white and coloured Trinidadians who had shunned the street festivities for 60 years or more gradually began to venture out of their houses on the three days preceding Lent and tentatively and cautiously to mix once more with black revellers on the streets. At one level - what we might call the ideal or mythical level - all racial, social and political hostilities in Trinidad are supposedly suppressed and forgotten for the duration of carnival; normal divided, even antagonistic, the whole population, says the myth, comes together as one. 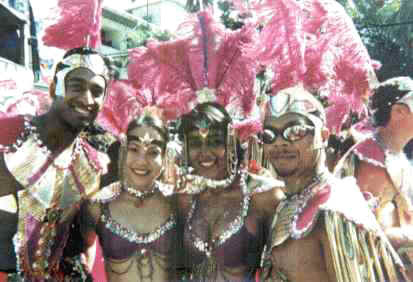 Yet very often, in bringing normally distinct and distant groups of the population together, carnival serves only to highlight the differences and hostilities between them; as recently as 1970, at the time of the so-called 'February Revolution', major political, social and, to some extent, racial confrontations occurred in Trinidad at carnival time . . . "
" . . . The world of carnival is, as many writers on the theme have stressed, as negation or subversion of the structures, hierarchies and values that obtain in society during the rest of the year. Carnival is 'the world turned upside down', a make-believe counter-society over which the pauper or madman is king and the servant-girl queen, and it is noticeable in this respect how carnival societies in Trinidad - as, no doubt, elsewhere - have their own elaborate hierarchies of kings, queens, princes, princesses, dukes, captains and sergeants-at-arms, just as, one might further note, secret societies among slaves had their elected kings, queens, dauphins and dauphines. Even toady, Trinidadian calypsonians give themselves, or are given, mock-royal, mock-aristocratic or mock-heroic sobriquets such as Lord Kitchener, Mighty Sparrow, Lord Beginner, Black Stalin and Mighty Chalkdust (the nom de carnival of schoolteacher Hollis Liverpool) as though to underline carnival's symbolic subversion of the structures of everyday life. The last shall be the first, the first shall be last : during carnival, the popular imagination throws up its own hierarchies of prestige, achievement and charisma which, at every point, challenge and fictively negate the hierarchies and norms of established society." Play mas' in these carnival bands with on-line service ! Visit their Web-sites now! POISON (Funlovers Inc.) : 1999 presentation - "GALACTICA"
PETER MINSHALL & THE CALLALOO CO. : 1999 presentation - "THE LOST TRIBE"
HARTS' CARNIVAL INC. : 1999 presentation - "LOCAL MOTION"
BARBAROSSA : 1999 presentation - "JEWEL OF THE NILE"
LEGENDS (BIG MIKE, IAN & FRIENDS) : 1999 presentation - "DYNASTY"
FUNTASIA : 1999 presentation - "RIVERLIME"
WAYNE BERKELEY and MASQUERADE : 1999 presentation - "TRAPEZE"
This page was last updated January 10, 1999.